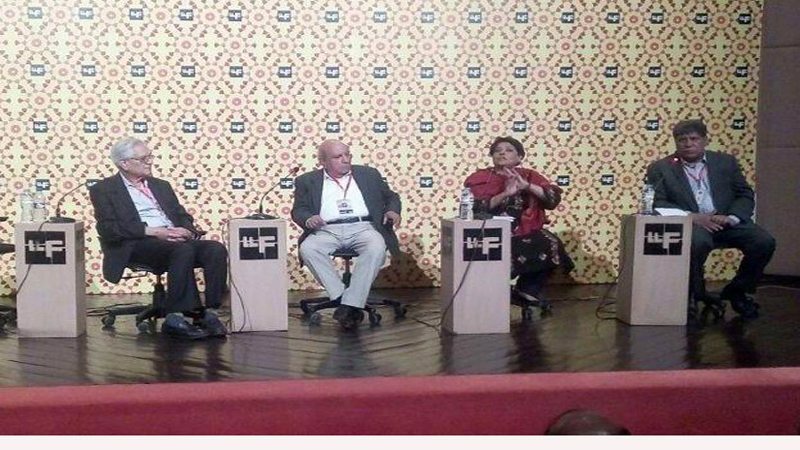 A session in remembrance of late columnist, poet, writer and humanitarian, Muneer Ahmed Qureshi alias Munnu Bhai was held at Lahore Literary Festival (LLF). The session titled ‘Munnu Bhai Ki Yaad Main Jangal Udaas Hain’, was moderated by acclaimed drama writer Asghar Nadeem Syed. Speakers included feminist poet Kishwar Naheed, human rights activist Ibn Abdur Rehman and columnist Masood Ashar. Addressing the audience, Asghar Nadeem Syed said that Munnu bhai was an integral part of his career as a drama writer and inspired a generation with his activism. “I used to visit him every day in the morning on my way to college as he used to write his columns during that time. Munnu Bhai was the most popular intellectual of his time and it was because of his loving personality,” Syed said. Kishwar Naheed told the audience about Munnu Bhai’s masterful playwriting skills and mentoring. She said that Muneer, apart from fulfilling his duties as a script writer, used to guide the actors regarding dialogue delivery, expressions and execution “Muneer was not just an outstanding playwright, he was a mentor too. He would guide the actors regarding dialogue delivery, expressions, when to smile, when to cry and about everything a character needs,” she said. IA Rehman, while addressing the attendees, regarded Muneer Ahmed as a multi-talented individual who had a firm grip over several subjects. He added that Munnu bhai neither compromised on his principles nor ignored his journalistic duties. “Muneer was a multi-tasker. He was chief reporter for Masawat and at the same time worked for television and remained a remarkable columnist. If you ask a piano player about science, he would not have an answer. But Munno Bhai was a jack of all trades,” IA Rehman told the audience. Paying homage to his late acquaintance, Masood Ashar said that Pakistan has ceased to produce brains like Muneer Ahmad. He also exerted that the deceased legend never compromised on his principles and that he never surrendered to ‘crushing authority’. “I do not see journalists like Munnu bhai in Pakistan anymore. He never compromised on his beliefs and principles. During Yahya Khan’s regime, he was exiled to Multan for vehemently opposing dictatorial rule. We, however, in Multan considered his arrival as a gift which changed the city for good,” Ashar said. In response to a question from one of the attendees regarding the decline of literature’s popularity among the current generation and a basic lack of association with giants like Munnu Bhai, Asghar Nadeem said that the growth of mainstream media and anchorpersons have deprived the youth of literary activities. He also complained that LLF is not being given enough coverage by mainstream media. Published in Daily Times, February 25th 2018.